*** How did you decide to do a radio show together? 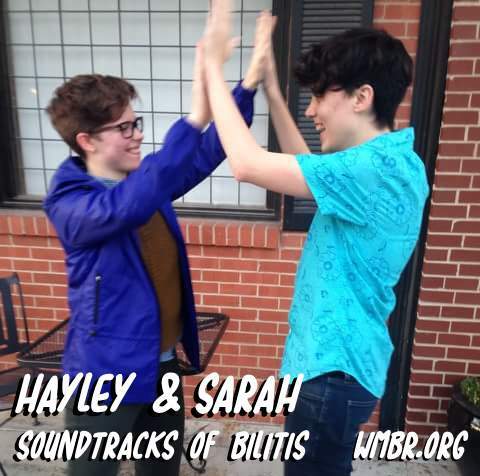 Hayley: Sarah and I have talked about doing some kind of radio show or podcast together before and when I saw a WMBR flyer up at work it just seemed like the right time! The actual concept for the show was her idea, which is good. I think anything she says is interesting because I’m gay for her but it’s fun to have constraints. Sarah: I took WMBR’s IAP class back in January and enjoyed it, so when Hayley sent me the poster for summer show proposals, I was excited to try to think of a premise. I wanted to base the show on a topic I’m excited about and involve related music– and I love queer films, so it worked! Hayley seemed like a natural co-host since we watch and discuss LGBTQ movies all time at home. It’s been a fun creative project to do together. *** Has hosting Soundtracks of Bilitis changed the way you watch movies? Hayley: Yeah, a little bit. I think I’m more willing to give any soundtrack a chance, even it it’s not totally flawless and beautiful. The thing about LGBTQ movies is that so many of them are low-budget, and if you’re no fun you can cringe at cheesy music or genre choices you don’t like, and I’m trying not to do that. One of my favorite movies is this Thai movie called Yes or No, and the music really adds to how much I love the movie but it’s not amazing. It’s really cheesy. And the actresses sing one of the songs together and one of them is a much better singer than the other. But I’m enjoying figuring out what it brings to the movie anyway, the same way that a big sweeping orchestra brings something to a bigger-budget film. Sarah: It’s definitely inspired me to pay more attention to their soundtracks and the role the music is playing in the narratives. One surprise has been how often music is actually a plot point in the movies we’ve discussed– for example, in Henry Gamble’s Birthday Party, Henry’s enthusiasm for secular music sets him apart from his friends from church. I’m not sure I would have noticed that pattern if not for Soundtracks of Bilitis. *** What LGBTQ+ movie tropes are you tired of? Hayley: Oh, so many. One thing I’ve definitely seen enough of is gay-bashing as a plot device. There was this one movie Sarah and I saw called Some Freaks, which is actually very sweet, but the ending felt like a real slap in the face–out of nowhere the gay character gets beaten to a pulp by some guy, and the straight characters end up bonding over it when they’re both in the hospital waiting room. And you never find out what happened to the gay guy! Gross. I mean homophobic violence is real and I think there should be stories about it, but sometimes it just feels gratuitous–like it’s just there to give straight viewers an emotional thrill–and that’s hard to watch. Sarah: To be honest, I pretty unabashedly love most LGBTQ+ movies. They’re never perfect, and I enjoy critiquing them, but, at the end of the day, our radio show is much more about celebrating movies we love than focusing on their flaws. But, to answer your question: I’m tired of LGBTQ+ movies that try really hard to pander to and educate conventional, cis, straight audiences. I’m all for everybody watching and enjoying LGBTQ+ movies but the pandering really limits possibilities. Love, Simon, for example, has an intriguing premise, but the gay teenage protagonist is white, upper-middle class, traditionally masculine, conventionally attractive, and generally well-behaved– and that goes largely uninterrogated in the movie. The movie even starts with a voice-over saying “I’m just like you… except I have a huge secret… nobody knows I’m gay,” as if assuming a straight audience. I actually really enjoyed Love, Simon– it’s cute, and I know seeing it in theaters was super meaningful to many queer youth– but I wish that LGBTQ+ movies didn’t have to sanitize themselves to make it to the big screen. *** Would you ever want to be a part of making a movie? What kind of role would you like to have if so? Hayley: Gosh not really! It sounds hard to put so much work into something that’s only going to be 90 minutes long. Maybe doing makeup or costumes would be fun though. Sarah: I’ve never really considered being part of making a movie, but I like making things and telling stories, so sure! I think I’d most like a writing role. *** Best part about going on the air? Hayley: Ha! My favorite part about going on the air is when nothing goes wrong when I play the music. It’s nerve-wracking to broadcast my mishaps so I’m always proud when everything goes smoothly. Sarah: I actually really appreciate having to embrace improvisation and flaws– we plan ahead, but since it’s live, we can’t go back and edit if we don’t like how we did something. So we just have to iterate our process a little bit every time we go on. It’s also fun to be able to share the things I like with other people. You can leave comments by clicking here, leave a trackback at http://blog.wmbr.org/wp-trackback.php?p=452 or subscribe to the RSS Comments Feed for this post. « WMBR’s Radio Animals: a Listener Photo Competition!